At long last, the day has finally arrived! It has been ten years to the day that the Wing Commander Saga project was officially founded. Through this time, Saga has evolved through a host of iterations, with sometimes frustrating twists and turns and several brick walls. However, we believe that Wing Commander Saga would not be what it is today without the lessons we have learned from each one of those experiences, and we are very excited to finally share the results with you. On many occasions, we have referred to Wing Commander Saga: The Darkest Dawn as a labor of love. That is truly what it has been for us. Many years ago, Chris Roberts and his team at Origin ignited our imaginations with their innovative, blockbuster Wing Commander series. Our hope has always been that with Wing Commander Saga, we could recapture that excitement and magic to some degree and share it with all of you. Our ten year development process has certainly taught us even more respect for just how innovative and brilliant Chris Roberts and his team are. Our development of Wing Commander Saga: The Darkest Dawn is meant as an homage to them and what they achieved, and we would like to thank them and EA, who holds the intellectual property for Wing Commander. We would also like to thank all the sites who have generously offered to provide mirrors for Saga. If Wing Commander Saga: The Darkest Dawn is your introduction to the Wing Commander universe, you owe it to yourself to try the source material that inspired us. Several of the original Wing Commander games are available at gog.com, so make sure to show your support for the actual creators of Wing Commander by going and purchasing some copies! You won't regret it. Especially make sure to pick up a copy of Wing Commander III, since the story of Wing Commander Saga: The Darkest Dawn was written to coincide with the events of that game. Today we are only launching the PC vesion. The Linux and Mac versions will be available soon. We just need to port the launcher to OSX and Linux and run some tests. For help troubleshooting known issues click here to visit our forums. We'd also love to hear your thoughts about the game, so feel free to join us there! 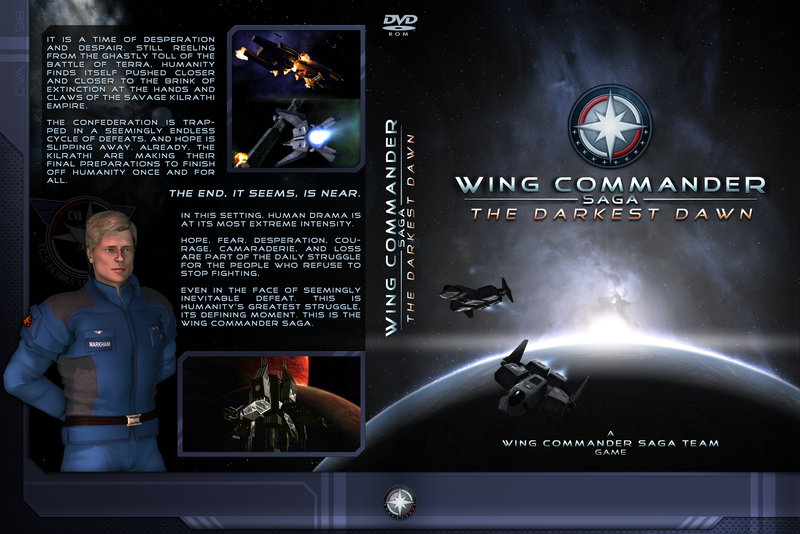 So, without further ado, we are pleased to present you with Wing Commander Saga: The Darkest Dawn. It's humanity's most desperate hour, a desperate struggle for survival against impossible odds, and you've got a front row seat. I have to share this saga must be good as I have a connection speed of 20mb but its downloading at 43mb a sec! Any plans for a torrent version? The gamershell mirror can be downloaded as a torrent. I don't think it's possible to properly thank you or the rest of the team for the gargantuan undertaking it took to bring this game to release. The end product is, without a doubt, one of the most impressive fan-authored products I've ever encountered. Congratulations, guys! I have not yet even started to download, and I probably won't be able to play the game for at least a week, but it's great to see Saga released at last! It's been a long time, and congrats to everyone for all their work over these years. Congratulations on completing on the project. Well done! It seems I shall have to wait a bit longer though, if my torrent client is to be believed it will take somewhere between 3 and 20 weeks to download the game. I wonder if this ISP has recently started throttling torrents. Downloading the GamersHell Torrent right now. Will also gladly mirror if needed. I can provide roughly a terrabyte of bandwidth each month - might not be much, but it could help. Let me know. Super excited. I've also noticed that the post says the game runs on top of the Freespace 2 engine: is this a mod / TC wherein I should have FreeSpace 2 from GoG or something? Or is this actually a full blown standalone game, like I'm interpreting it to be? The torrent improves with every added user, I'm currently seeing 700kB/s down but it doesn't look like all of it is easily available - yet. Jump on! Or is this actually a full blown standalone game, like I'm interpreting it to be? Indeed. The game is fully standalone. I'm seeding now, and will continue to seed, probably through most of the weekend. My downloads only averaged about 400K, but I'll take it, considering speedtest.net shows my timewarner upstream bandwidth is less than 1mb, so I'll only be contributing like 40K/sec to the uploads. But I'll do my best! I encountered New Heur PE Virus at 80% mark of the install. NOD 32 wont let me finish the install! Waiting patiently for the OSX version Congrats everyone.